In an out of the way corner of southern Tuscany, about 45 minutes from Orvieto, is a town perched on a volcanic ridge – one of the most evocative sights of Italy – Pitigliano, the little Jerusalem. George Dennis, the noted Etruscologist, described it thus in 1847: Pitigliano is a place of considerable importance, with some 3000 inhabitants, of whom more than a tithe ( a tenth) are Jews, led to congregate here, as at Gibraltar, by the annoyances and persecutions they are subjected to in the neigbouring state. (Dennis is referring to The Papal State, modern Lazio a mere 5 miles away. He needed a passport to cross the border.) 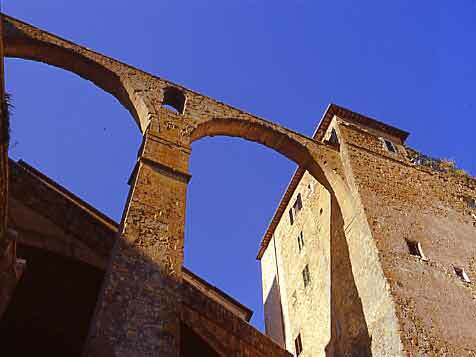 In spite of the wealth thus created, Pitigliano is a mean and dirty town, without any interest inside its gates. Though there is little to interest the antiquary at Pitigliano, there is food for enough for the artist. Few towns in volcanic Etruria are more imposingly situated and in the midst of finer scenery. For at least 500 years this small community hosted a Jewish ghetto now sadly reduced from the 300 of Dennis’ day to just two persons, eighty year old Elena Servi, tireless custodian of the ghetto museum and synagogue, and her son. There may well have been a small Jewish community in the 16th century which moved here from Rome to benefit from the enlightened protection of the Orsini family, but there was certainly an influx of Jewish families from Castro after its annihilation in 1649 by Pope Innocent X – a misnomer if there was. His mistress and sister-in-law, the fearsome Donna Olimpia, had a particular beef with the Farnese family, lords of the territory and prompted the pope to erase their capital Castro from the map. 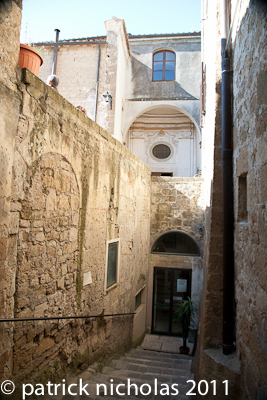 The 17th C. ghetto lay below the principal church clustered around the synagogue on the edge of the cliff – so close in fact that half of it fell into the ravine in the 1960s. The tiny ghetto contained a Jewish world much of it underground: there were schools, cellars, dwellings, ritual baths, bakery, yeshiva (religous school), large library and even a kosher slaughter house. 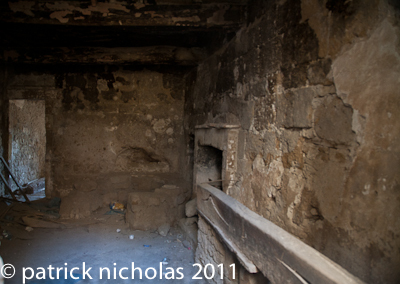 All of the population of Pitigliano lived hugger mugger but the crowded conditions of the ghetto must have rendered it particularly insalubrious. During the early 19th century the majority of the Jews moved out into more commodious accommodation on the edge of the old town. This was the golden age when the community grew to 400. Reconstructed corner building where Elena Servi lived until 1943. Sadly, but predictably, it has neither the beautiful loggia nor the elegant stonework of the building nextdoor. The building by the main gate in which many Jews lived including Elena’s family was blown up by the Germans in 1943 in order to swing their vehicles around the bend. The post war re-construction is easy to see. The Jewish cemetery is on terraces on the side of the ravine outside town, fittingly below the Christian one on the ridge above. 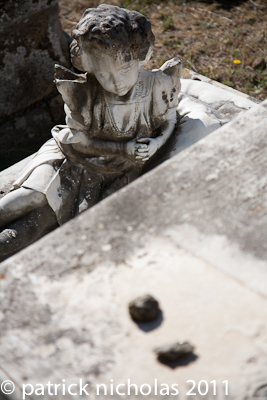 Burials from the end of the 19th century show an extraordinary similarity to monumental Christian cemetery with strikingly unorthodox broken columns, statues and even an angel which goes to show how assimilated the community had become. But the community went into inexorable decline with the Racial Laws promulgated by Mussolini in 1938. 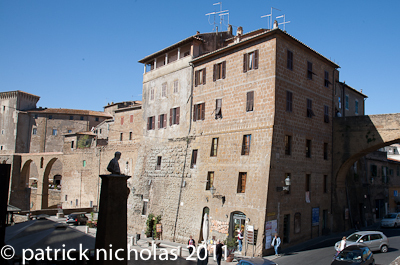 Life became very difficult for the Jews in Italy and no less so in Pitigliano. Jews lost their jobs and had their businesses closed, children were segregated into separate schools. 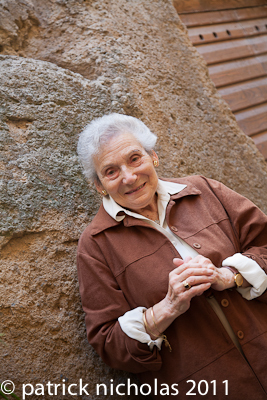 Elena Servi recounts how her family were rescued from deportation and almost certain death in Auschwitz by the local peasant population who hid them in cottages, farms and caves from 1943 to liberation by the allies in June 1944. The only Jewish victim turned out to be a dentist who was killed by the allied bombing raid on the bridge in 1944 which also killed the town’s photographer and scores of others. Nobody had realised he was Jewish at the time as he was from Romania. During the raid he had been operating on a German officer, who survived. So much for benevolent destiny. Few Jews returned from Rome and Livorno after the war and the lack of a quorum for the synagogue in 1959 resulted in its closure. The roof subsequently fell in and followed by half of the edifice collapsing into the ravine. When I climbed in over the high gate in 1985 it was a picturesque, but sad ruin. By 1990 however it was completely restored and the ghetto converted into a museum – now much frequented by visitors, but nowhere near as evocative as in the ’80s. The cemetery is not visit-able except by groups but Camera Etrusca is always allowed entrance, a contribution to the Synagogue fund is always appreciated. For more two fascinating personal stories: Elena Servi, curator of the synagogue and Marcella Servi who emigrated to America after the war. I remember the first time I visited Pitigliano and zona, I was enthralled with the landscape and structures and surprised to learn about the ghettos, something I never would have associated with Italy.